Super Hero Boy: When you think it can't get any better! When you think it can't get any better! Kung Fu Panda won our hearts with its story of the most unlikely of panda's becoming one of the most important kung fu masters known to man! I recently did a review and am hosting a giveaway of the standard version. However I've always said great movies are great.. but great movies on bluray are amazing! The quality of the movie on the standard version is great but the vivid colors on the bluray version is really a knockout. As well there are quite a few sound affects that I never caught on the standard version that are stunningly clear on the bluray version. As always though the real benefit to a bluray presentation compared to a standard is the extras. The extras on Kung Fu Panda bluray there is a trivia track that is fun for the whole family. Along with the exclusive bluray features there are some bluray downloads that are available among my favorite are the Po Around The World. In the Po Around The World feature you can see Po in 12 different languages which is very interesting. It reminded me a bit of watching my favorite TV shows while I was in France and trying not to laugh at seeing shows that I watch every week in another language. I think kids especially will really be interested in seeing how their movie sounds to kinds halfway around the world! Adults will really appreciate the Animation Corner which gives you a more insight look into how Kung Fu Panda was inspired visually as well as how Kung Fu Panda was made both visually and its sound track. Older kids might find it really fun to see but the younger kids may not be as interested. Don't worry there is TONS of extras including games, dance routines, music and even a mini cooking show that will get kids into the Kung Fu Panda action. 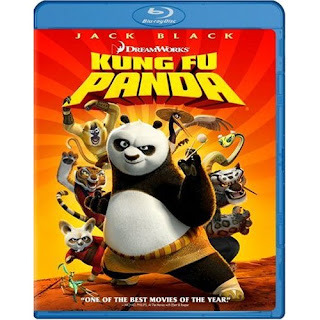 Kung Fu Panda is available right now in both its standard format and bluray. You can pick up the bluray edition over at Amazon! Kung Fu Panda is my current fave to watch with my boys! It is awesome!